Our last full day on the boat. Sigh. We decided to explore Sucia a little, so we walked some nice trails over to Shallow Bay, where I had initially wanted to overnight. Karen and the park sign listing the yacht clubs that bought the island and gave it to the park service. 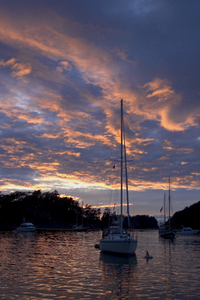 Best of Times in Fossil Bay, Sucia Island. But we were on minus tides, so Shallow Bay just would have been too shallow for comfort. It looked like a great place for sunsets. Karen overlooks Shallow Bay. Lots of mud at low tide. Spur of the moment, I suggested we head for Jones Island, another Marine Park that was about an hour way. I had read that it was a nice place, and we had nothing better to do. As always, the park dock was full, so we got another mooring ball and went ashore in the dinghy. What a lovely place. The island is well kept and has great “lawns” on both the north and south ends of the island with picnic facilities and campsites. The island suffered a major blow down of large trees in a 2000 storm, and many have been left to decompose in place. It makes for an eerie sight. 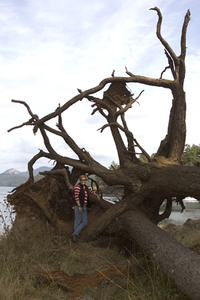 Karen poses with uprooted trees from the "big blow" on Jones Island. We took the southwest trail, which was a gorgeous walk along the southwest side of the island. A narrow but nice trail, it stayed very close to the water with some precipitous drops. I had read that Jones Island had tame deer, but didn’t expect to see one. We saw a small doe that came right out of the forest to greet us and walked within 10 feet of us. I was torn between wanting to make friends and wanting to shun it for all the damage its brethren do to our trees and plants back in Philadelphia. Tame deer on Jones Island. We had a quick lunch, and then left for Stuart Island and Reid Harbor, our last anchorage for the trip. It was a quick motor to Reid, we snagged a mooring ball, and spent most of the evening packing and cleaning up the boat. Bob made shrimp scampi for dinner with prawns from Canada….another great meal. Karen settles in for an evening of reading in the pilothouse.